Climbing has never been so much fun! We supply a wide range of fitness technology and gaming fitness products. Also known as active gaming, exergaming, immersive fitness and interactive fitness, the future of fitness is continually evolving. We offer stylish and functional technology products that are geared towards improving overall health and wellness through improving reaction time, balance, co-ordination and strength training exercises for all muscle groups. Whether individuals challenge themselves to improve their fitness, or compete against others, most of our products provide essential feedback through recorded performance scores so improvements can be tracked over time. 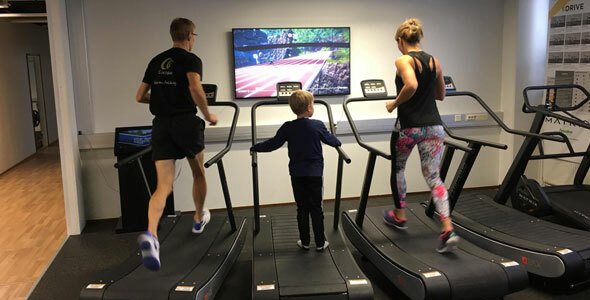 One of the most crucial aspects of any fitness program is enjoying it, and a key advantage that fitness and gaming technologies have over traditional forms of exercise is that not only do they provide physical activity, they also offer high levels of engagement. It is well known that stimulating the mind while excercisng reduces the perceived level of exertion and participants are more likely to do regular exercise. 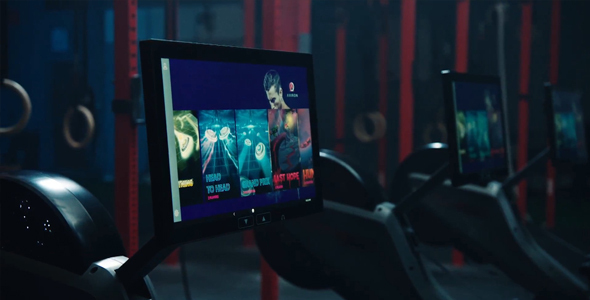 Our gaming and interactive fitness range has been purposely selected to offer the best possible immersive experience. As the fitness and health market continues to grow worldwide, Axtion Tech UK are well placed to serve the UK as well as the other European countries. We can guarantee short lead times and tight delivery schedules. 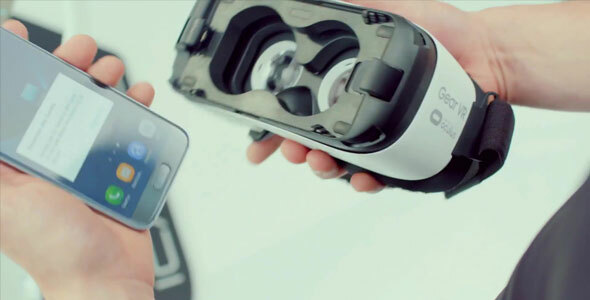 If you're looking for cutting-edge fitness technology products, get in touch with us today! ICON products have been created with the input/development from professional coaches and clubs. Designed to develop a range of attributes in a footballer's skill set using LED lights and vibration sensors to create targets. Systems can track successful and unsuccessful hits and send this data to the scoreboard. 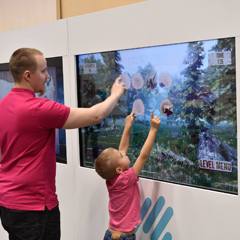 The tapWall provides innovative touchscreen games for both adults and kids alike. It's the perfect activity to stimulate your upper body and relieve tension in your neck and shoulders. Additionally it improves memory and sharpens reaction time. The tapWall is compact and ideal for gyms, hotels, schools and airports. 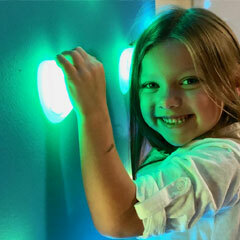 Easy to design, manage and install, GlowHolds will bring your climbing walls to life. The multi-coloured LED illuminated holds are both eye-catching and key to the immersive experience. Instantly change climbing routes with the ClimbItControl controller. Users can set their own routes which are then illuminated by the GlowHolds. Although we have a range of products for outdoor and home use, our principle clients are gyms, hotels, trampoline and adventure parks, schools and climbing centres. Improve your leisure facility with products such as floor sprint and step configuration grids, interactive climbing walls, wireless LED light workout systems, immersive reaction walls and High Intensity Interval Training ('HIIT') fitness equipment, interactive floor/wall projection gaming systems and much more. Ideal for personal fitness training or for rehabilitation after physical injury, we'll get your members active and provide an exhilerating sensory experience at the same time. We pride ourselves on our ability to stay ahead of the curve in sourcing and supplying new and innovative products. If you want to get ahead, and stay ahead of your competition, there's no better way than to introduce fresh and engaging products. We strive to provide the highest quality products by industry-leading brands that you can trust. Whether it's aesthetics or durabilty, we're confident that you won't be disappointed by the quality and the improvement to your leisure facility. A sizeable portion of our business comes from repeat customers and through word of mouth recommendations. This is because we truly understand the value of first-class customer service standards. We ensure that all of our staff adhere to this.